As we announced a few days ago, we are now pleased to provide you with more details on the partnership we just signed with eToro for one dedicated crypto strategy based on low-frequency strategies on BTC, ETH, EOS, LTC, USD, and XRP. The idea of this partnership is to get some visibility on the eToro platform so that their community will start to be aware of our existence for crypto investment solutions. We believe that with the strategy that we will put on their platform, we stand a reasonable chance to be high on their leaderboard. As a reminder, the way eToro works is that you have some traders that have been selected to advertise their strategies and some other traders might decide to copy them. The “copy” feature is embedded in its platform, and it is quite user-friendly. Then depending on the number of people that are following you, you get some remuneration. In order to be visible and copied, we have decided to trade 30k USD on our Napoleon Crypto portfolio. People will replicate our trades when we do. eToro has been proposing cryptos for some time now, but fees are expensive if you have a big turnover in our portfolio. That is why we have decided to extract some strategies that we have and that have very few trades to minimize cost impact and still offer interesting returns. That is why we will propose an allocation strategy on ETH, BTC, EOS, XRP, LTC and USD based on similar strategies as the two described in the last Newsletter. 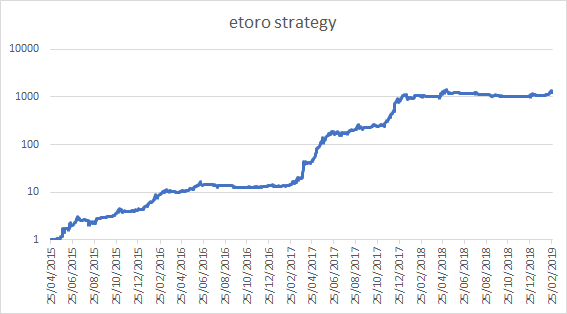 This is a dedicated strategy for the eToro community and will not be displayed on our napoleonx.ai platform. Above is the backtest of the proposed strategy. For this backtest, we have taken 1% of fees per trade, so it is quite conservative. Use our Link to create a new eToro account. Follow us on Twitter @napoleon_group. ReTweet the pinned tweet or join our telegram channel. Fill up the dedicated form. Trade wisely on eToro or subscribe to our copy-fund! As a way to incentivize early joiners, we will offer 120 NPX for the first 50 joiners, 80 NPX for the following 100 joiners & 50 NPX for the remaining 100+. This offer is open to our entire community and beyond! This link will take you to our unique & official profile on the eToro platform. We are currently in a validation process that will take between three to four weeks to complete, although our portfolio is live and anyone can see the performance on the eToro platform. We will inform our community as soon as the CopyFund is active. This partnership is a new step in the right direction to become more visible for our project. This is only a teaser for what we can offer when people have access to our platform, and we do not intend to go beyond this one strategy on their platform. It is a way to be paid to do our marketing and to access a much wider audience of traders. The next step is already underway, and we are actively developing the bots that we should launch later in March. Hopefully, our community will have grown at that stage thanks to this marketing push.